S'il y a bien un Disney qui mérite son adaptation en comédie musicale, c'est La Reine des Neiges ! J'ai hâte mais ça ne sera pas avant quelques temps que cette comédie musicale sera sur pied. Ça semble être en bonne voie ! Je me demande comment vont ils faire pour le pouvoir d'Elsa ... Ca va necessiter pas mal d'effets speciaux ! Parfait L'histoire de ce film se prête mieux à un musical qu'à un film d'animation. Je pense même qu'ils auraient plus en du faire un musical d'abord qu'un film d'animation. "Conceal it,Don't feel it "
"My power flurries through the air into the ground My soul is spiraling in frozen fractals all around And one thought cristallizes like an icy blast I'm never going back the past is in the past "
GENIAL !!! J'ai hate d'avoir plus de nouvelles concernant ce projet ! Déjà rien que le fait de dire que la comédie musicale se tiendra dans "quelques mois" me semble étrange. Aucun autre site n'en parle, aucune annonce officielle pour l'instant. Aux dernières rumeurs Idina Menzel et Kristen Bell serait très fortement pressentit pour reprendre leurs rôles respectifs sur scène. Je remonte ce sujet pour savoir si quelqu'un a des news. Le sujet sur la dernière de la belle et la bête (que j'ai eu la chance de voir une fois) me donne envie de remonter à Paris pour une nouvelle comédie musicale disney! La première devrait avoir lieu à Broadway en 2017 sous la direction d'Alex Timbers. Jennifer Lee, scénariste et coréalisatrice du film, travaillera sur l'adaptation en comédie musicale. Les époux Kristen Anderson-Lopez et Robert Lopez écriront quelques nouvelles chansons pour la comédie musicale. Par contre, Idina Menzel, la voix d'Elsa dans le long-métrage, ne devrait pas participer à cette production. Thomas Schumacher, qui est à la tête de Walt Disney Theatrical Productions, a précisé qu'aucune date concrète ne pouvait être communiquée à ce stade du projet. Frozen, a new musical based on Disney’s Academy Award®-­‐‑winning musical film, is slated to join Disney hits Aladdin and The Lion King on Broadway at a theatre to be announced in spring 2018, Disney Theatrical Productions announced on TwiJer @FrozenBroadway. Sign up for email alerts at FrozenTheMusical.com. 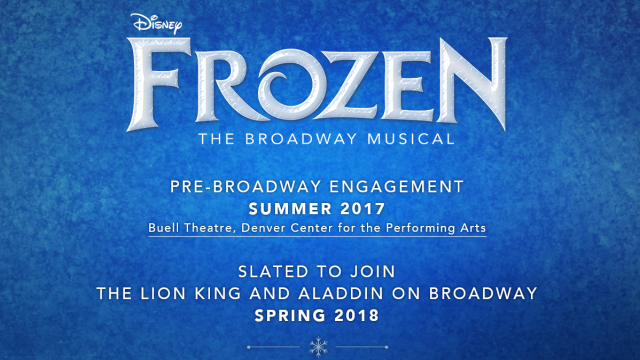 Frozen will play its out-­‐‑of-­‐‑town tryout at the Buell Theatre in the Denver Center for the Performing Arts in August 2017. For information on the Denver engagement visit DenverCenter.org. 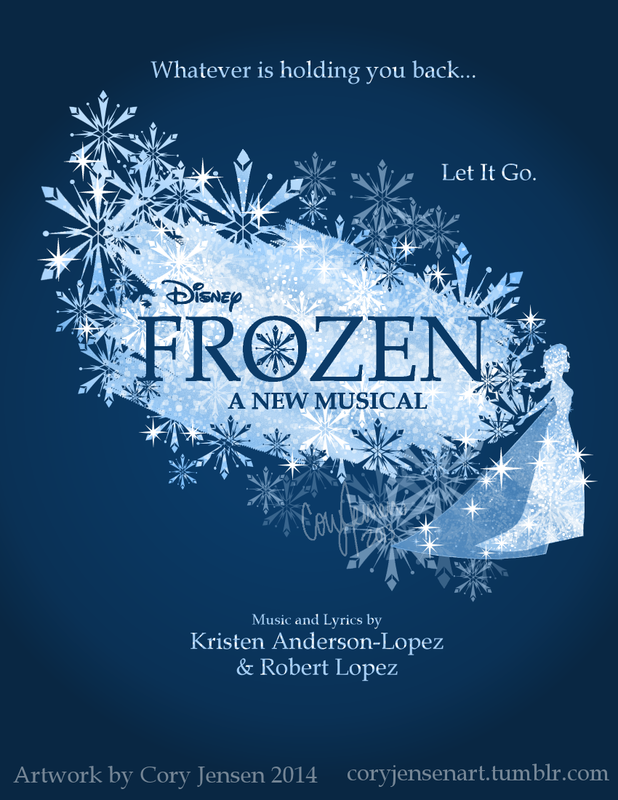 As previously announced, Frozen features music and lyrics by creators of the film score Kristen Anderson-­‐‑Lopez (In Transit, Up Here) and Robert Lopez (Avenue Q, The Book of Mormon, Up Here) and a book by Jennifer Lee (Wreck-­‐‑It Ralph), the film’s screenwriter and director (with Chris Buck). Frozen won 2014 Oscars® for Best Song (“Let It Go”) and Best Animated Feature. Golden Globe Award and Obie winner and two-­‐‑time Tony Award® nominee Alex Timbers (Peter and the Starcatcher, Here Lies Love, Amazon’s Mozart in the Jungle) is Frozen’s director and Tony-­‐‑ winner Peter Darling (Billy Elliot, Matilda) is choreographer. The design team for Frozen includes scenic and costume design by seven-­‐‑time Tony Award winner Bob Crowley (Mary Poppins, The Coast of Utopia, An American in Paris), lighting design by five-­‐‑time Tony Award winner Natasha KaJ (Aladdin, An American in Paris, The Glass Menagerie) and sound design by four-­‐‑time Tony nominee Peter Hylenski (The ScoLsboro Boys, Motown, After Midnight). Two-­‐‑time Tony Award winner Stephen Oremus (Avenue Q, Wicked, The Book of Mormon) is music supervisor and creates vocal and incidental arrangements. 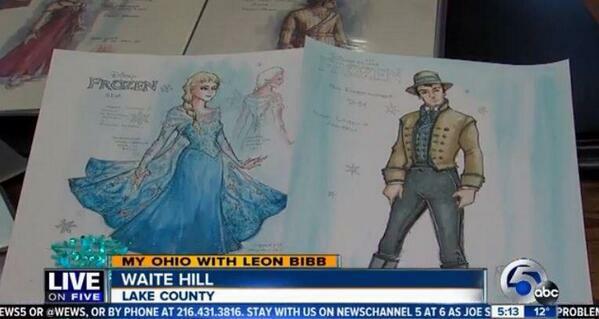 Image : Disney Theatrical Productions. Donc ça prend forme tout ça ! That’s cold! Disney has dismissed the director of its Broadway-bound “Frozen” musical. The company said Thursday that it was seeking a replacement for the director, Alex Timbers, a much-praised artist whose previous collaboration with Disney, as one of two directors of “Peter and the Starcatcher,” brought him a nomination for a Tony Award. The president of Disney Theatrical, Thomas Schumacher, offered a few more details in a separate statement. “Making the tough calls when creating a new Broadway musical is never easy, but this was especially painful,” he said. A Disney spokesman said it was not clear what impact, if any, the “Frozen” change would have on that show’s developmental timeline. The company previously said it intended to mount a production of the musical beginning next August at the Denver Center for the Performing Arts, and to bring it to Broadway in the spring of 2018. 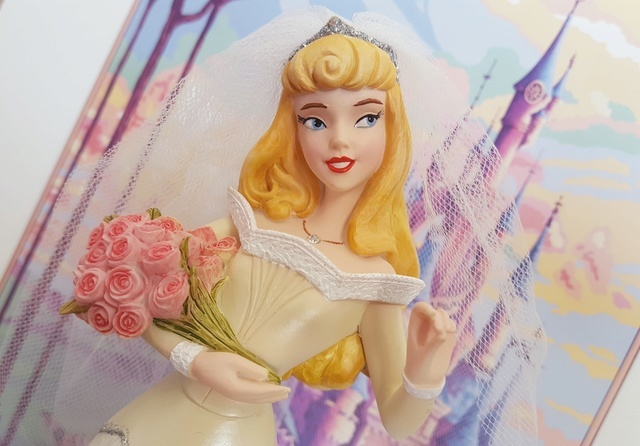 The show is to feature music and lyrics by the same couple who collaborated on songs for the hit 2013 animated film, Kristen Anderson-Lopez and Robert Lopez, and a book by Jennifer Lee, who was the film’s screenwriter and co-director. The New York Times - 4 août 2016.